If you read the first two installments of Lube Notes, you have probably come to realize that I am gradually equipping you to evaluate lubricating products including a comparison between synthetic oil vs conventional oil. I am convinced that understanding some basic principles of lubrication can free us from believing everything that we read or hear. In this issue, I will briefly explain how petroleum oils are refined, introduce synthetic base oils and explain motor oil’s classification system used to assign quality levels to finished base stocks. Crude oils from different regions of the world can be different with some being naphthenic and paraffinic. The paraffinic are much better feed stock for lubricating oils. Naphthenic oils contain no wax and are superior in cold flow applications. All crude oils contain roughly the same mix of hydrogen and carbon: 83 to 87 percent carbon and 11 to 14 percent hydrogen. Oxygen, nitrogen and sulfur round out the elements, with various metallic compounds also trapped in the oil. When dealing with lubrication qualities, it is important to consider the variation of molecular structure – from one molecule to the next – within the same sample of crude. Paraffinic molecules come in various carbon and hydrogen combinations to be sure, but to grasp the near-infinite molecular arrangements, consider a typical oil molecule of 25 carbon and 52 hydrogen atoms: this compound can occur naturally in any of 37,000,000 different molecular arrangements. Crude oil refining is not a static industry and improvements resulting in the production of better quality lubricating oils certainly occur. Refineries are using improved techniques to separate and remove asphalt and wax by tighter cuts of molecular weight. The most significant improvement is the innovation of hydro-treating, which can produce pure base oils with all contaminants removed, a move toward the ultimate goal of producing a pure hydrocarbon product absent of the impurities found in the original crude. 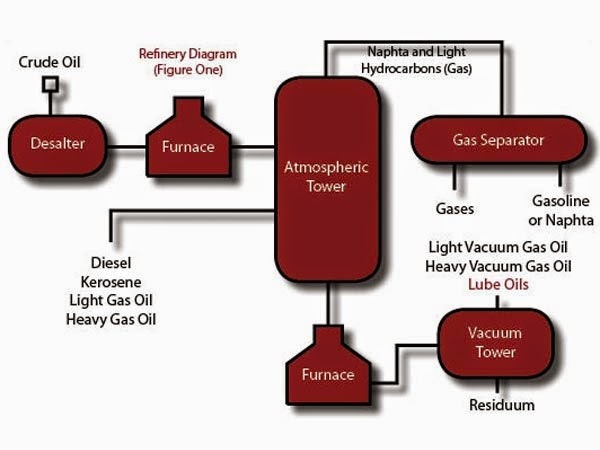 The path of crude petroleum through an oil refinery. After being processed in the Atmospheric Tower, some of the remaining fractions require further heating and distillation to produce Lube Oils. The molecular composition of petroleum oil compared to that of synthetic oil. The black triangles in the petroleum oil represent naturally occurring contaminants. 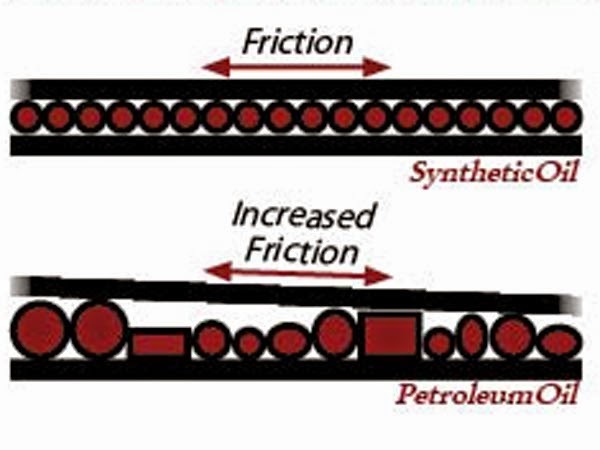 Increased friction results from the distribution of the irregularly shaped hydrocarbon molecules that comprise petroleum-based lubricating oils. The uniform nature of synthetic molecules reduces friction relative to petroleum oil molecules. I said it would be a brief explanation of crude oil refining and I stuck to my word. Now it’s time to give a brief explanation of synthetic base oils and then take a look at the quality groupings. Again, this very brief fundamental understanding of the differences in petroleum and synthetic oils will serve you well in any and all discussions on finished oil products. Synthetics have historically been defined as oils that synthesize light weight molecules to form heavy weight lubricating molecules. This definition is certainly true, but some variation has been allowed to include modifying the original molecular structure. The chemists are continually perfecting the design and production of various synthetic molecules, but the goal is always to produce the best design for the intended application. You can see this in the origin of synthetic oils by Standard Oil in the 1930s. These first synthetics were intended specifically for problematic lubrication applications. It was not until World War II, when the Germans found themselves with little petroleum that large scale production of synthetic lubricating oils began. By the end of the war the advent of jet engines required the first true large scale practical application of synthetic oils. Jet engines require oils capable of lubricating at minus 50ºF and up to 400ºF, a task simply beyond any petroleum oil parameters. Synthetics come in several different chemical compounds. I will only address those used for automotive and truck applications (there are several for industrial and specialty applications). Alkylated Aromatics, Esters, Polyalphaolefins (PAO) and Hydrocracked Petroleum make up the vast majority of synthetics used in auto and truck applications, so let’s take a brief look at each. These are synthetic hydrocarbons that are compatible with mineral oils and used for industrial applications such as compressor and hydraulic oils. I have purposely grouped the esters for simplification and am only addressing the common characteristics, not the separate individual properties. Esters have very high viscosity index (VI) ratings and excellent low temperature fluidity. Additionally, esters have good lubricating properties and excellent thermal and oxidation stability. One double edged sword for esters is the exceptional solvency and detergency that makes them super cleaning agents. It is important to recognize the cleaning capabilities of esters and use them prudently. Esters can be manufactured in a variety of geometric shapes and molecular structures and it is critical to use the correct esters for the intended application. Esters are not uniformly compatible with all seals, paints or varnish finishes. PAOs are synthetic hydrocarbons that are compatible with mineral oils; they exhibit a very high viscosity index and very low temperature fluidity. PAOs are used in virtually every sector of lubrication from automotive to industrial. PAOs are compatible with seals and paints in the same way that mineral oils are compatible. Esters are blended with PAOs for superior base oils for high temperature gear and bearing oils. These are natural hydrocarbons processed by hydro-treating/hydro-cracking to produce a pure base oil, absent of any impurities. This process de-polarizes and modifies the natural petroleum and thus qualifies the oil as synthetic by virtue of the molecular modifications. So there is my brief description of synthetic base oils. All oils, both mineral and synthetic are placed in groups to indicate the classification (Table A). As you can see in Table A, the groups are based on oil purity and viscosity index. Saturates relates to the oxidation stability of the oil and Sulfur represents the percent of sulfur in solution. Although PAOs only have to be greater than 120 for viscosity index, 135 is common. Esters will usually have a viscosity index of greater than 140 and both esters and PAOs are free of sulfur. Oil base stock quality is based on many factors in addition to the classifications listed in this table, but the groupings in this table are referred to throughout the industry. For instance, hydrocracked synthetic is typically referred to as a Group III synthetic whereas PAOs are referred to as Group IV synthetic. Next time, we will mix up a quart of oil in order to better understand how combining base stocks and additives affects the finished product as well as what the need for additives reveals about a given product’s quality.